Summary High performance dual-band, three-stream 802.11abgn router with bandwidth metering, external USB drive and printer sharing w/ UPnP AV / DLNA media server and completely new admin GUI. 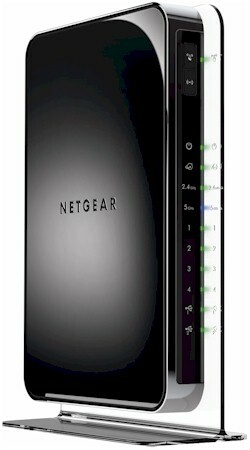 The WNDR4500 is probably the last of NETGEAR's new router introductions for the year. Depending on how you look at it, it either pushes aside the WNDR4000 or WNDR3800 for top-router-dog spot in NETGEAR's current lineup. The table below, which I pulled from the WNDR3800 New to the Charts review, shows the current offerings, which may be one or two too many and drive some consumers into a brain freeze when it comes to choosing one. The first thing that stuck me about the 4500 was its weight and size. The router itself is a bit larger and heavier than any of its predecessors. Part of that weight comes from the clear plastic non-removable base that runs the entire length of the router. I suppose you could lay the router on its side, but, given the design, NETGEAR clearly doesn't want you to. However, a bigger contributor to the 4500's box weight is the brick-style 12V @ 5A external power supply that you'd more expect to come packed with a NAS. Apparently, the technology that makes the 4500 tick has a significantly larger power appetite than your typical router. The controls and ports are pretty standard for NETGEAR's top-end WNDRs. The front panel gets both wireless on / off and WiFi Protected Setup (WPS) buttons and all the indicators you'd expect. The main difference on the rear panel is two USB 2.0 ports vs. the usual one. So you can connect both a USB printer and USB drive to share, without having to juggle connections or deal with a USB hub. NETGEAR requested a 180 day block that went into effect at the end of July on most of the informative FCC docs. So after testing was complete, I opened up my review unit to see what I could see. I got as far as looking at the bottom view shown in Figure 4. All six antennas (three each for each of two radios) are glued to the top and side of the top cover, making it difficult to flip the board over. I decided it wasn't worth it, after a brief peek at the top side of the board revealed heatsinks on just about all the key components. Some poking around turned up a post on the DD-WRT forum, saying the 4500 has a Broadcom BCM4718 chipset. But since that chipset supports only dual-stream N, that's not likely. Instead, two BCM4331 Single-Chip 802.11n Dual-Band 3x3 SoCs is my guess, which NETGEAR confirmed. They also said that external power amps and low-noise front-ends are also baked into the design to further tweak wireless performance. NETGEAR told me that, instead of sharing one of the 4331's CPUs for routing duties, a Broadcom BCM4706 is used, which is a 600 MHz MIPS32 74K Core processor. We also know, because it's right on the 4500's datasheet, that the 4500 has 128 MB each of RAM and flash. I've assembled the comparison table below that has guesses only for the Gigabit switch. You can think of the 4500 as a three-stream version of the WNDR3800, but with fewer features. The briefing material from NETGEAR positions the 3800 as a "lifestyle" option and the 4500 for "performance" buyers. The table back in Figure 1 shows you won't be able to use the 4500's "ultimate USB storage performance" for your Apple Time Machine backups. Nor will you be able to remotely access it via the ReadyShare Cloud feature. On a more positive note, you do get the new Genie interface that I first saw in the WNDR3800 and you also get its same IPv6 WAN connection features. Craig Ellison will be going through the 3800's new features and interface in a review that will post later this week or early next and I'll refer you there when it posts. In the meantime, suffice it to say that all of NETGEAR's traditional routing features have been carried to the 4500; they just have a new look. You can also download the user manual for more details.